On March 19, 2019, Pacific Juvenile Defender Center (PJDC) President Patti Lee was recognized as a champion of peace and nonviolence and visionary community leader by the City and County of San Francisco during the Board of Supervisor’s celebration of Women’s History Month. 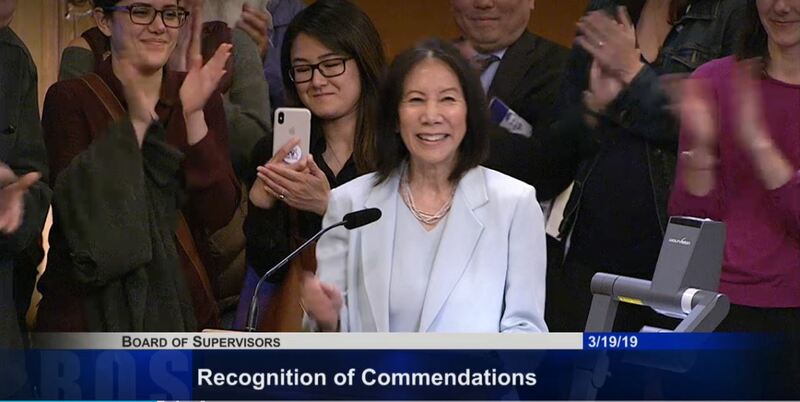 Since 1996, the San Francisco Commission and Department on the Status of Women, in partnership with the city’s mayor and board of supervisors, has celebrated Women’s History Month by recognizing the contributions of women in the community. This year’s celebration focused upon visionary women, who as champions of peace and nonviolence, through their public service and leadership, have improved the quality of life for all San Franciscans. In addition to her work as the Managing Attorney of the Juvenile Division of the San Francisco Public Defender’s Office and PJDC President, Lee has served on multiple boards, commissions and working groups aimed at shaping juvenile justice policy on a state and national level.